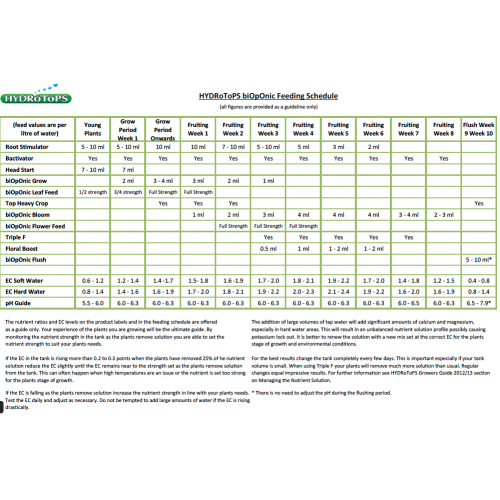 HydroTops Head Start provides the correct ratio of major and trace elements from the very start of a plant's life. This ensures a smooth and stress-free transition from the seedling or cutting stage towards the vegetative stages and beyond. With its ability to intake larger amounts of feed (thanks to its "head start" in life) your plants will be able to use the nutrition available during growth and bloom much more effectively with no down time. Many growers often use half-strength nutrient when dealing with young plants and cuttings in the early stages of plant growth. This isn't ideal and can lead to two main issues later on in life. Firstly, the trace elements are under supplied (as it's at half the original strength) and secondly, the profile of the main elements (nitrogen, potassium and phosphorus) are not in a correct ratio either for the early stages. Because of these two points, the plant will adjust its bio-chemical processes accordingly and restrict growth rates, both above ground and below. As a result, when nutrient levels increase as the plant moves into vegetative growth, it cannot assimilate the higher levels of nutrition offered for several weeks, this can lead to poor flowering performance and, worse still, nutrient lock out. 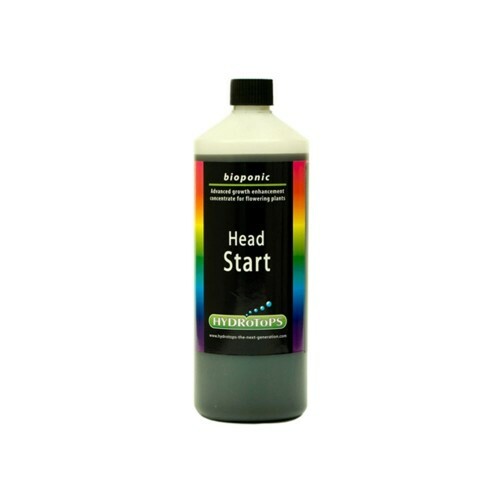 HydroTops Head Start can be added alone to your water at a rate of 7ml per litre but ideally use it alongside 5-10ml of HydroTops Root Stimulator to feed both roots and green growth collectively. To use HydroTops Head Start on rock wool cubes or any other propagation media type, pH the starting water to between 5.5 - 6.5 using pH down, then mix in 7ml of HydroTops Head Start and 5-10ml of HydroTops Root Stimulator. Allow the feed to be absorbed by the media before gently squeezing out the excess and proceed to gently insert your cutting or seed.